SOCHI, May 15. /TASS/. Russian Prime Minister Dmitry Medvedev on Tuesday presented his vision of the structure of the country’s new government. He handed over a draft decree on the new government to President Vladimir Putin. Medvedev said he believes there should be no major changes in the structure of the next government. "Considering the fact the existing government structure has proved its functional capability, there shouldn't be any fundamental changes in it," he said at a meeting with President Vladimir Putin. 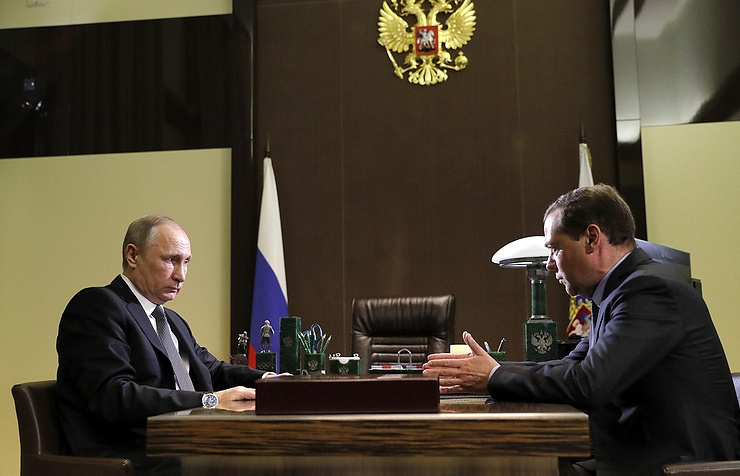 Medvedev voiced several ideas aimed at optimizing the incumbent system of executive agencies of power. The prime minister suggested transforming the Telecom Ministry into the Digital Development Ministry. "An important change suggested for review is the transformation of the Ministry of Communications and Information Technologies into the Ministry of Digital Development, to implement the digital agenda the whole world is dealing with and which is absolutely actual in our country," Medvedev noted. Medvedev also proposed splitting the Ministry of Education and Science into the Ministry of General Education and Ministy of Science and Higher Education. One of the ideas suggests the splitting of the Ministry of Education and Sciennce into two separate agencies of state power. One of them, the Ministry of General Education, will supervise the system of general secondary schools and vocational schools and colleges. The other, the Ministry of Science and Higher Education, will coordinate the activity of research ofganizations and universities, Medvedev indicated. The Russian Ministry of Industry and Trade is planned to assume management of operations of the Russian trade representations overseas currently under the Ministry of Economic Development, the prime minister said. "An idea is important that is related to transfer of operations of trade representations, which are now in the system of the Ministry of Economic Development, to the structure of the Ministry of Industry," Medvedev said.